Slide your phone and tablet inside these pouches that float on water. You really want a selfie in that pink flamingo float—which also happens to be the ideal location to finish an e-book. Slide your phone and tablet inside these pouches that float on water, and the only thing you"ll have to worry about is how to gracefully dismount an inflatable bird (good luck). Can you still text, post, and scroll? Yep, the clear window is designed for all that. 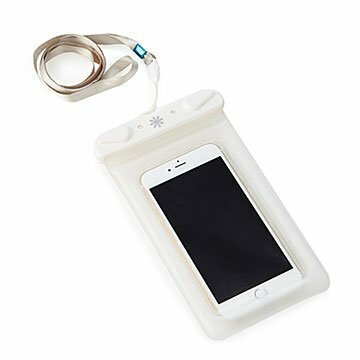 Bring them along wherever you may encounter a splash zone—boat deck, beach, camping, bathtub—and take comfort knowing your devices will live to see another day. Made in China. I have this product (bought while traveling abroad) ar a water park. Everyone there using these while in wave pool. Can use the touchscreen and take photos. Obviously can't use fingerprint unlock. Very tight seal- not just a "ziploc" or rollover top- it cinches with clips. Hangs from neck Have bought many as gifts.